We never underestimate the power of color. Our beautiful blue floral arrangements are sure to please. 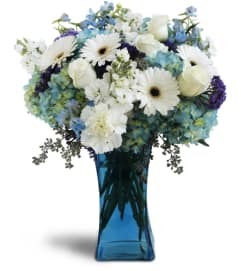 Deep blue color abounds in these carefully selected bouquets from Vanderburgh Flowers, and make a beautiful floral gift. Vanderburgh Flowers is a Lovingly Florist in Georgetown. Buying local matters. Discover how Lovingly supports local florists. Copyrighted images herein are used with permission by Vanderburgh Flowers.